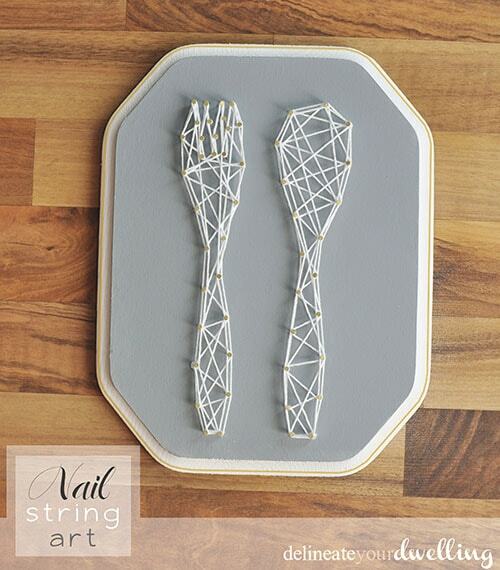 I love creating art for my walls and today I am sharing this easy Kitchen Nail String Art project. It only took me an hour and looks perfect on the wall! I bought a raw wood plaque at my local, Hobby Lobby. My first step was to paint the wood. I used Slate Grey Americana Acrylic paint and then added a white trim border. 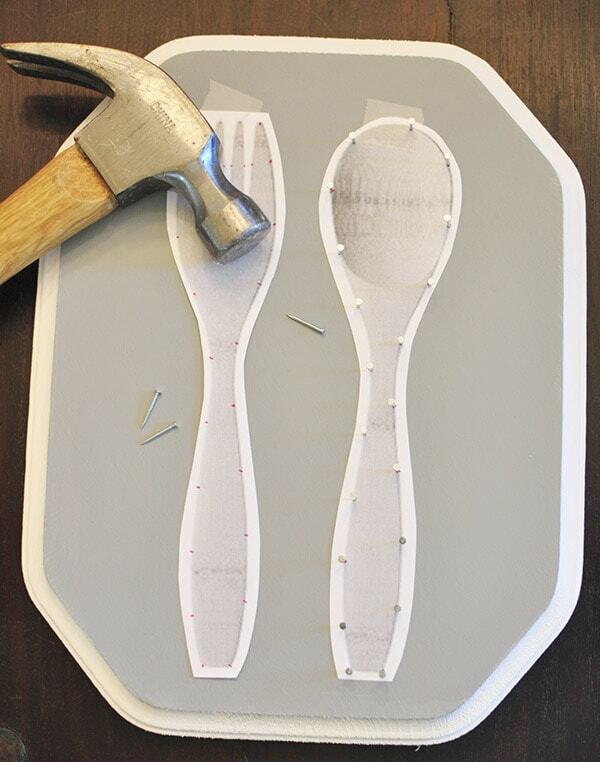 Then, I searched the internet to find the perfectly shaped fork and spoon image. Once I found my image, I printed and cut them out. 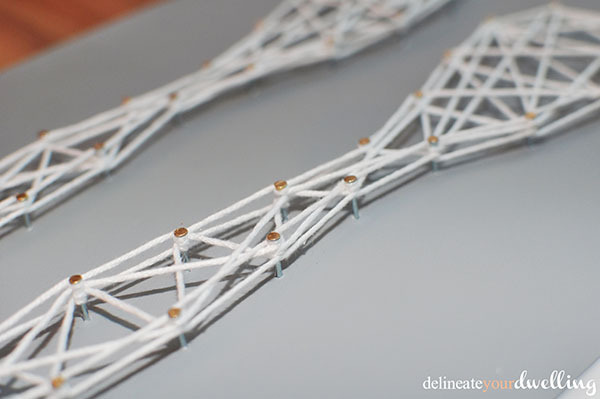 Using the pink dots as a guide, I started hammering in my nails for the main structure of my string design. After you have all the nails in place, you can remove the paper. Then, I tied a small knot at the end of my string and wrapped it around a lower bottom nail. Slowly, I wrapped along the perimeter of my spoon + fork. I circled each nail a few times to make sure the perimeter was really secure. Once the perimeter was completed, it was time for the fun! I wrapped back and forth and then I zigged and I zagged. This takes a bit of eye-balling to make sure there isn’t too much string around certain nails or it’s not visually too “thick” looking. 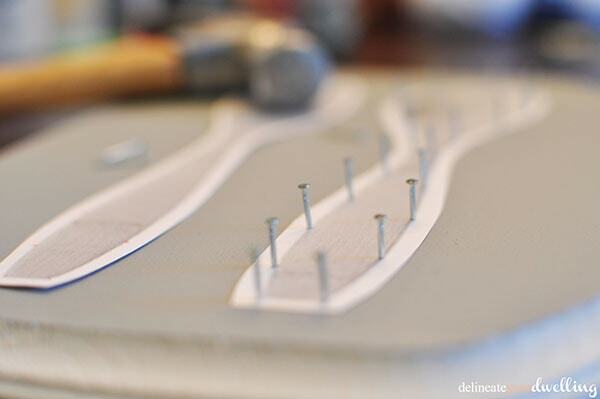 After you feel your string is adequately wrapped, tie off the string and cut it as close as you can to the nail. I ended up putting a small dot of hot glue on the beginning and end of my string, just to give it some extra holding power. After my project was completed, I LOVED it but felt it seemed just a tiny bit dull. I had recently purchased a gold foil paint pen because like the rest of us, I’m living in a gold crazed world. I painted just the tips of the nail heads with a small glimmer of gold. Then, I added a small outline of gold around the trim of the wooden plaque. This was such a simple and fun DIY. 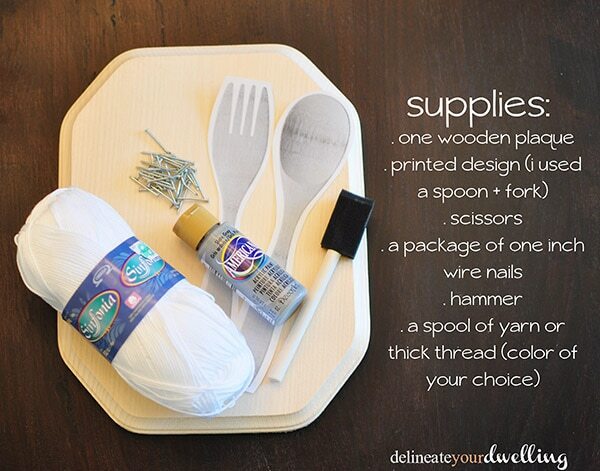 I honestly can’t wait to start another Nail String art project! 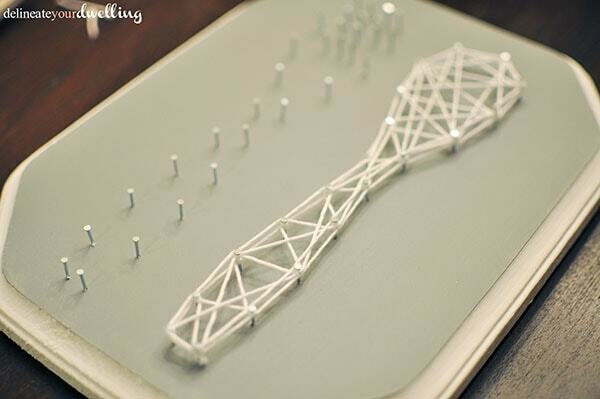 What about you, what Nail String project will you be starting? I love this idea. I’ve been looking for some kitchen all decor and our neighbor just dropped off a bunch of scrap wood. Thanks for sharing. Oh so fun, Erlene! Yes, this was a great quick project. I am a sucker for spoons and fork! these are so cute! I will be making these for sure! I am stopping by from http://www.sparklesandglue.com found you on the friday craft frenzy! 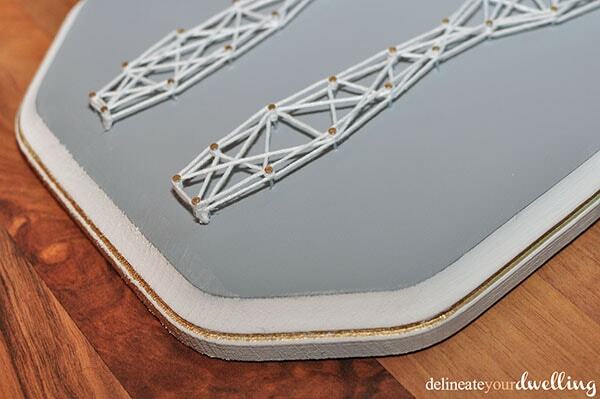 Love this project so much that I decided to feature it on the Awesome Things blog hop! Post will be going live tomorrow! Thank you so much for linking up with us, and I hope you will join us again this week! Thank you for the feature, Victoria! This is SO awesome!! Love the spoon and fork! I’ve done a similar one with my son’s name but never thought about the kitchen! Thanks for sharing with Life Created Tuesdays last week. I hope you’ll join us again this week; party goes live tonight! Very chic and simple, Amy. I am LOVING it! Well, how clever is this?! Love it! Thanks for the inspiration. So glad I found your link at The Craftberry Bush link party! Love this. I am glad I’m not the only one that thinks spoon, fork and other various utensils make the cutest art for the kitchen. I mean, I know it’s obvious, but it’s the cutest. 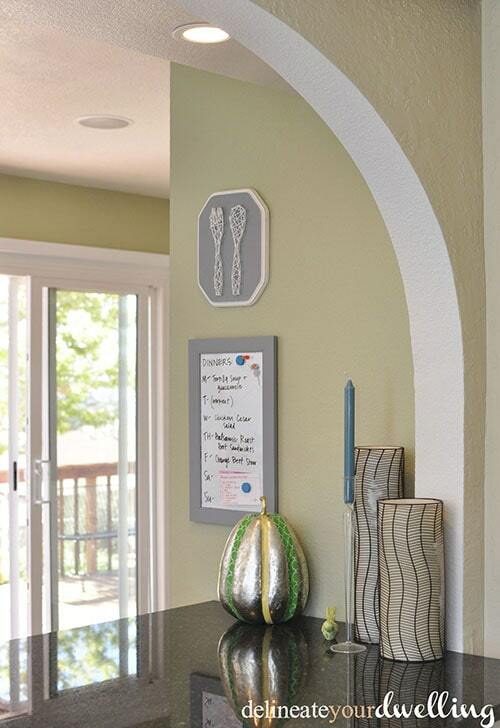 I know, totally love the spoon, fork, knife kitchen decor! Thanks for stopping by. I’m stopping by from the Simply Create linky party! This is such a fabulous idea, and would make a wonderful gift too! Pinning it now so I’ll have it for later! I was surprised at how easy it really was. Definitely would make a fun gift. Thanks for stopping by! So cute! I’ve wanted to make a nail art project, but couldn’t figure out what room to put it in. Maybe I’ll try the kitchen! Thanks so much for sharing this at the Whip it Up Wednesday party!